Born in 1950 in Pasadena, California, Chris Chapman is a prolific regional artist living in Santa Ynez. Chris is a member of the Oak Group, a small but auspicious group of preservation minded painters. Since 1986 they have raised $2 Million for protection of open space in four California counties. In the early 2000s Chris and painter husband co-managed Arroyo Hondo Preserve on the Gaviota Coast. Her native plant illustrations for Heyday Books’ Chumash Ethnobotany led to a permanent installation in the Ventura County Museum of Art. 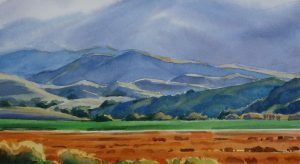 She is a Signature Member of several national pastel societies and Honorary Lifetime Member of Santa Barbara Art Association. After many years teaching outdoor and studio painting classes, today Chris enjoys full time for her own art. She volunteers for Wildling Museum of Art & Nature in Solvang.